Flashdance - the Musical is a story of hopes, dreams, friendship, and struggle; it has a great lesson in following your dreams and always trying even though you don't know what the outcome would be; take that leap of faith and if it doesn't work just get back up again. Alex Owens (Karli Dinardo) dreams of being a dancer but for now, she works at the Hurley steel mill during the day while performing at a club run by Harry (Michael Kingston) at night. With the encouragement of her friends, she applies for the Shipley Academy, an exclusive dance school. Her dreams are complicated when Alex gets involved with Nick Hurley (Adam J Rennie), grandson of the steel mill founding father, who is having problems of his own when the board of directors demand he make job cuts. The musical started out strong with the energetic number featuring the lead lady and ensemble, and set the tone for the night. There was lots of dancing, as expected, and the songs are filled with toe tapping beats; lots of bass drum and good rhythm that will have you bobbing your head along. Flashdance - the Musical features familiar songs like "What a Feeling," "Maniac," "Gloria," "Manhunt," and "I Love Rock & Roll" as well as 16 brand new songs have been written for the musical. The catchy tunes will have you wanting to dance along! Both Dinardo and Rennie have powerful voice and Dinardo sings very well in her solos but sometimes she is a bit drowned out during their duets. The dialogue was sprinkled with funny one liners and flashy costumes, glitter, leg warmers, bright colors, tights will have some feeling nolgastic of the 80s. It is a great show overall with good entertainment value. 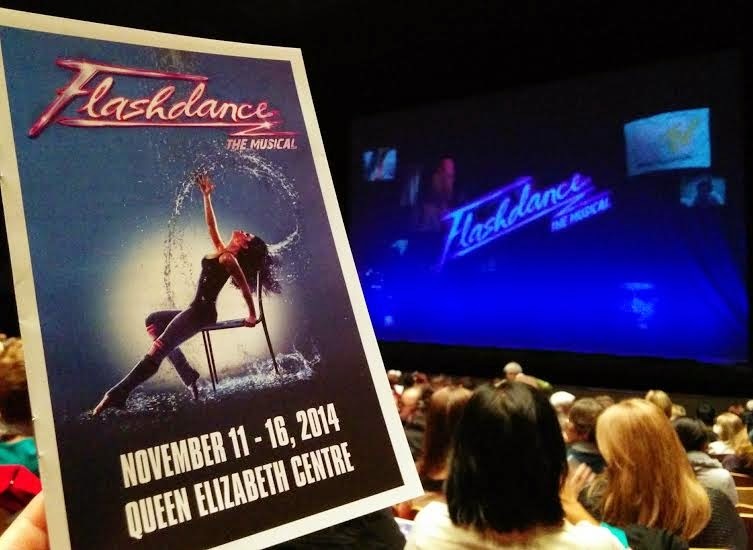 Flashdance - the Musical is now playing at the Queen Elizabeth Theatre from now thru November 16, 2014. Tickets are on sale at Ticketmaster.ca starting at $51.